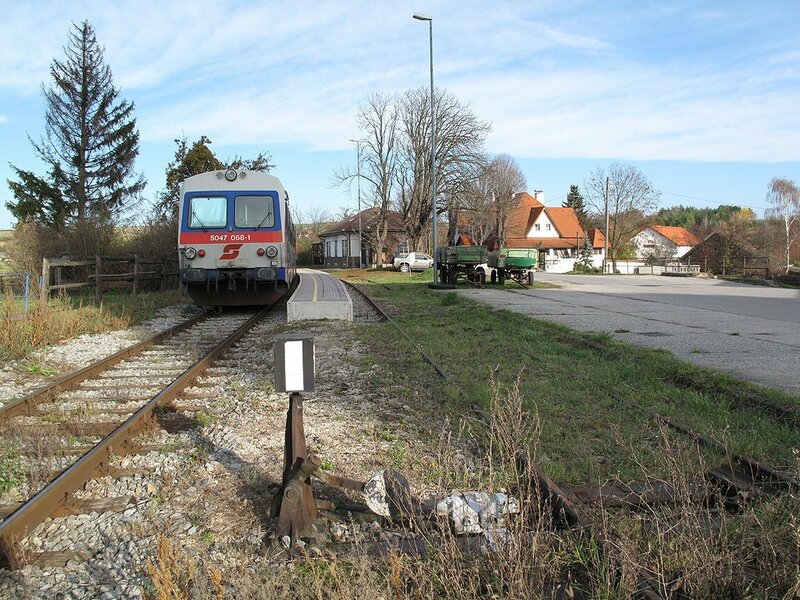 Just as I’d settled down for the winter there came the rumour of some branch line closures in Austria, at the end of the current timetable in Mid December. An investigation on Hafas revealed that I could get round them all in (just) daylight at the loss of only working day, and an investigation of Ryanair revealed a reasonable fare to Linz, so off I went. Good to note a quiz win last night against the White Lion! Early start though, for an 07:05 departure by car to STN as I couldn’t devise any way of leaving later and not getting caught in traffic. At least I proved myself right by doing so, and losing 35 minutes in the process. I still had time for a diversion to the level crossing at Offord, so that I could see a few 91s in their last day of private operation before becoming Son of BR at midnight tonight. Onwards to Stansted where security took exception to my rucksack and emptied it out for me before checking it for explosives and re-scanning it. In fairness though, they were very polite and offered to repack my bag if I wished. The problem apparently was that it was so closely packed (to get within Ryanair’s restrictions) that the scanner couldn’t see through it. Well, I’m happy enough not be blown up and I was reassured by the diligence. Once over that little hurdle there was time for an excellent pint of Adnam’s at the airside ‘Spoons before the inevitable Ryanair scrum and a punctual (well, 20 seconds late to be truly pedantic) departure for Linz. Still time at Linz Hbf for a visit to the Spar for a Gösser Märzen and the tobacconist for a Euromillions ticket. Fingers crossed. [to no avail. I didn’t get a single number]. 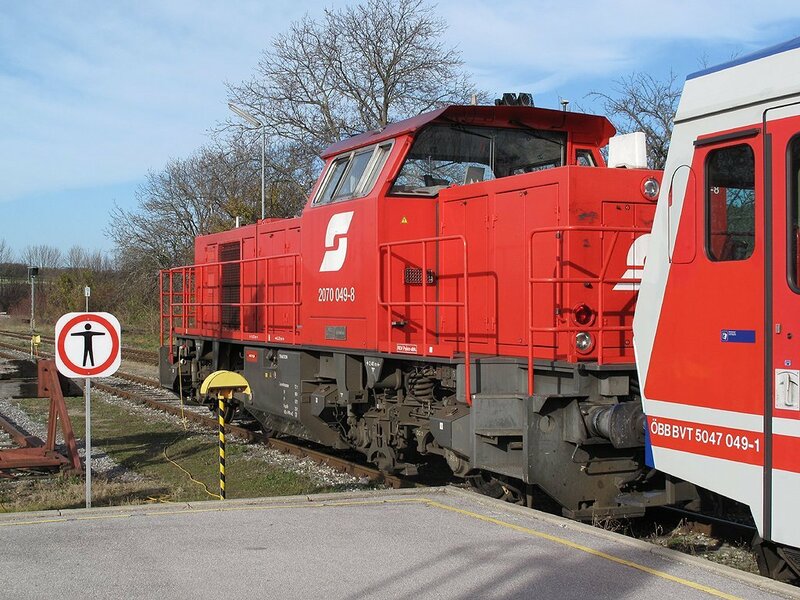 The 17:30 EC (ex Klagenfurt, a warning for Monday perhaps) arrived wedged behind Gysev 1116 065. I managed to find a seat in an open though, so no problem. Hotel (Hauser Eck) was located without problem as it’s on the southern edge of the pedestrian precinct (the station [St. Pölten Hbf] is on the northern edge). Getting a meal was another matter, with the hotel booked up for music night and the only pub I could find, wedged. So I had to settle for McDs and an early return to the hotel where my channel-hopping was rewarded with a very enjoyable documentary about steam trains in the Czech Republic and Saxony! Reasonable (08:39) start today. Fortunately I chose to get up early and so got down to breakfast just before the main influx of locusts. Goodness knows what all these people (mainly female) managed to find to do in St. Pölten on a Friday night. Staff (all one of him) completely overwhelmed but the breakfast was OK. Hotel was a bit ordinary but I suppose for €43 in this day and age, and Austria, not too bad. Fog had been threatened by the ZAMG weather forecast and it was duly there at St Pölten. Not too bad though, with the vis at an acceptable 800m+ and by the time the 4020 had made its way to Loosdorf the sun was shining. The same applied at Pöchlarn where 5047 012 was waiting in P4. SEV from Scheibbs to Kienberg-Gaming which is rumoured to be closing in mid December. If it does, then I’ll lose the last bit; if not then I’ll have to traipse out here again to do it! Bit of a double whammy but the decision was to do it today anyway because it’s awkward and if it close beyond Scheibbs as threatened then it’s done as far as possible. Scheibbs has a small licensed garden shed (Kaiser) but it didn’t appeal so I went for a wander round the town. Tempted into Billa on the way back I was rewarded with the really excellent Zwettler Festbier, 6.7% and tasty to match. A model railway shop was noted on the platform at Wieselburg an der Erlauf – also a vast modern rail-served brewery, ostensibly Kaiser. Wonder whose Wieselburger is, then? Only 12 minutes at Pöchlarn on the way back so not really time to visit the pleasant looking buffet (the free Gents’ was useful though!). On to St Pölten in a 5 car Dosto set shoved by 1116 037. Although I was earlier than I’d expected there was nothing to be gained so I decided to split the ‘lunch hour’ between St Pölten abnd Krems. Accordingly I wandered over to what seems to be the only ‘proper’ pub in St Pölten centre, the Gösser establishment just across the road from the station. I’d forgotten how horrible really smoky pubs can be ... the Gösser was OK though (but over twice the price of the supermarket Festbier). The 1333 to Herzogenburg beckoned then (a 6020) so that, hopefully, is the last I’ll see of St Pölten. [Three weeks later, the new ÖBB timetable is still showing Kienberg-Gaming with a train service, so hopes dashed, it would seem, not to mention a wasted trip to Scheibbs]. 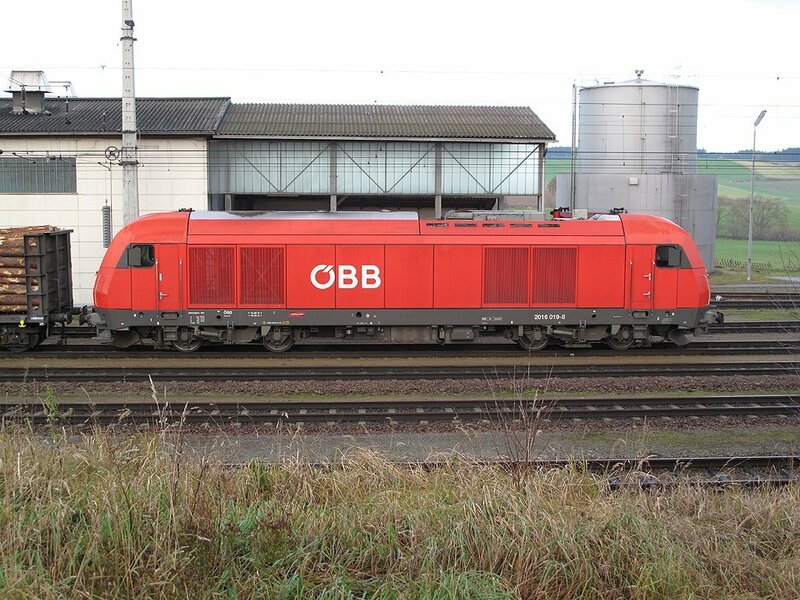 While waiting at St Pölten I was surprised to see a DB101 hauling an internal ÖBB service (Wien-Salzburg). 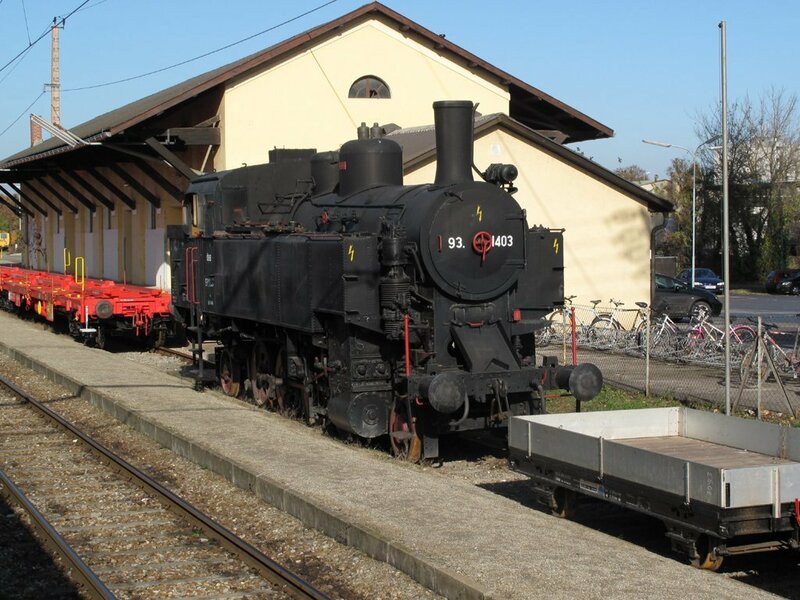 That said, last night’s internal EC from Klagenfurt to Wien had a Gysev loco. 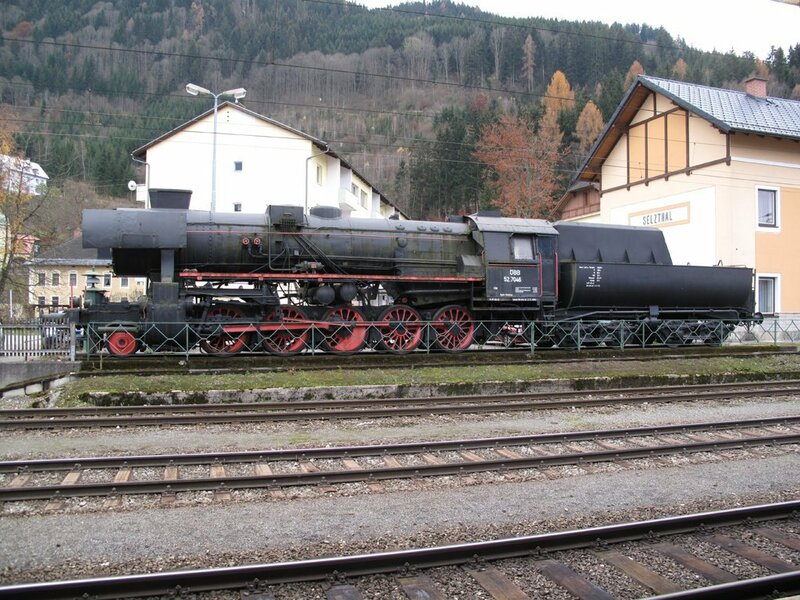 To Krems on an S40, changing at Herzogenburg, which is currently a major shambles, on to a 5047 or some such. There was time for a wander at Krems – the station may be ugly on a Birmingham New Street scale, but what a nice town. There’s a lot more activity there on a Saturday than there is at St Pölten. After a brief supermarket visit (Wieselburger Gold) it was another 5047, 011 this time, for Sigmundsherberg. Turned out I’d slightly miscalculated the daylight – a desperate phot just about worked at Horn at 16:30 but it’s not looking too good at 16:41 for the 16:43 departure, Still, better dark than not at all – and it isn’t quite! It is incidentally a typical valley line most of the way from Krems but with a change to far more open land after Rosenburg. Quite well patronised, and with everything in apple pie order as usual. Plank am Kamp in particular was very smartly, and it seemed recently, repainted. Then it got better... quite a posh looking restaurant on the station approach, which didn’t look suitable for an itinerant scruff looking for a swift(ish) ‘alf. Down to the bottom therefore, turned left to find a chenist’s shop followed by nothing. Turned back, to find that the lights I had thought were part of the posh restaurant were in fact a Zwettler pub next door. Naturally I crashed straight in, to find a very smart and friendly pub which was a perfect venue for my 40 minute wait. Interesting to note some of the older bods in very traditional dress (and to see same on sale in the shops in Krems, too). 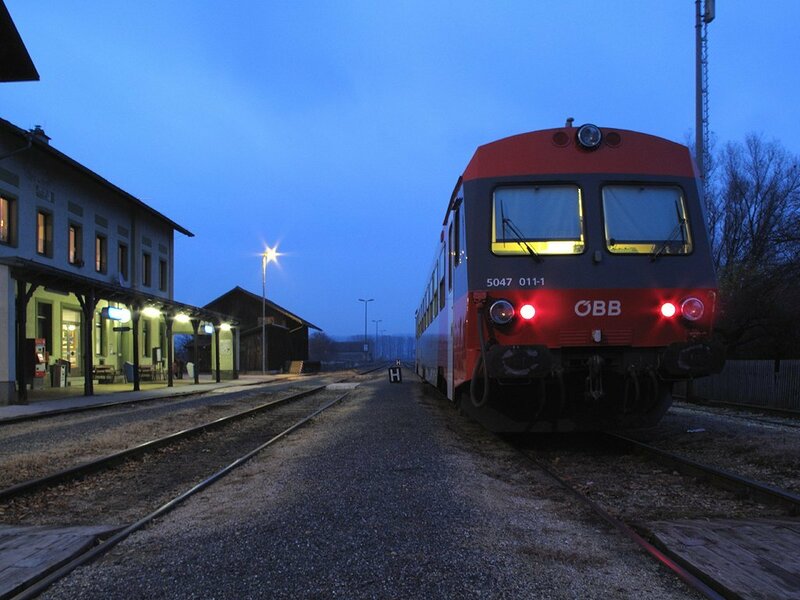 Final train was to Gmünd in the dark. The hotel was easily located – leave by the subway to Alberchtserstrasse, turn left, cross the level crossing and you’re there. Perfect. Friendly gaffer with a bit of English, making for a very useful establishment which might merit another visit when I come back to do the track in daylight. Down town then for some food – the usual wide choice boiled down to Hopfel in the main square. A range of Schremser beers (I tried the ordinaire) and an unfiltered one also from Schremser, allegedly a special for the pub. Heard that before, but tried it anyway. It was unexceptional in both formats. The pork medallions were just the job though! Not a particularly comfortable night as I couldn’t find anything to turn the heating off! Early doors for the 06:17 to Schwarzenau, still dark unfortunately. Dawn’s just starting to show but we’ll still be shy of the ‘one field’ target. Just about one field by Schwarzenau, not that it mattered. Excitement at the appearance of the 5047 in the main line P2 instead of the south side bay P11 as advertised, tempered by the realisation that the Waidhofen line goes off northwards! A nice little branch it is too, running as a parallel single line for quite a distance eastwards out of Schwarzenau before dropping away to the north and climbing to Waidhofen. [This was another possible closure which appears not to be happening]. Back at Schwarzenau the 35 minute connection afforded me time to walk down the road and photograph 2016 019 outside the small depot. 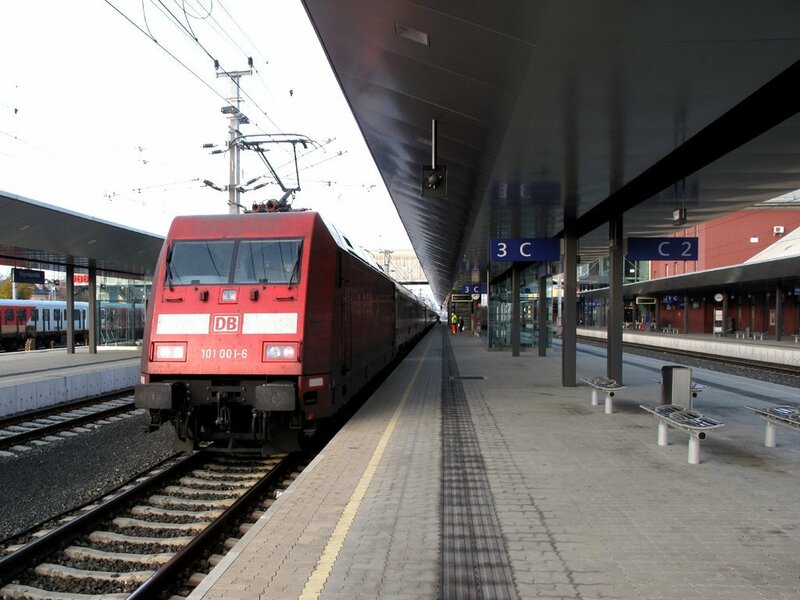 The 08:15 to Gmünd surprised me by being three loco hauled ČD coaches (the loco was Austrian but I didn’t note what it was). 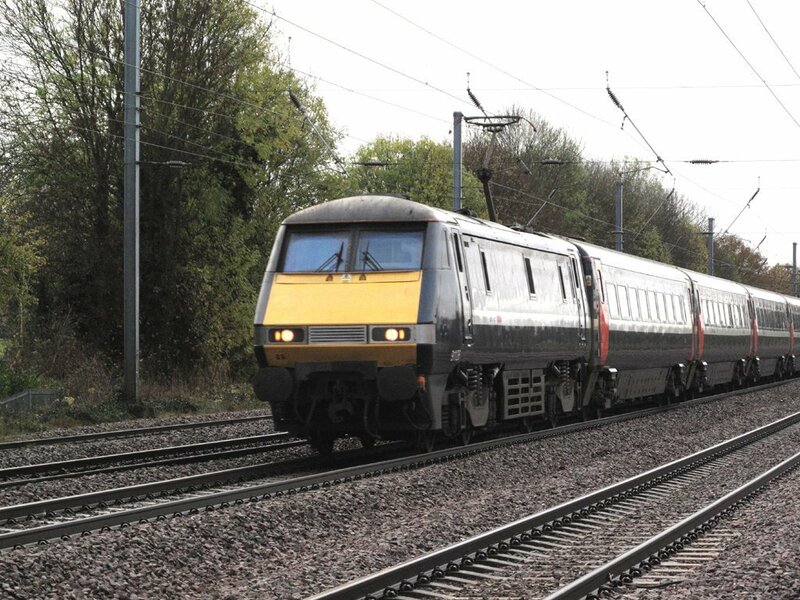 Also seen was a 5047 going to Zwettl – these use P21 which is the north west end of P1, so do the physical connection. Good news, when I get round to it. Next move was to Wien [well, that was the plan] behind 1044 040 which turned up with four fairly horrendous ex-IC compartment coaches. A very uneventful run then, scenery or anything else, to Absdorf-Hippersdorf. 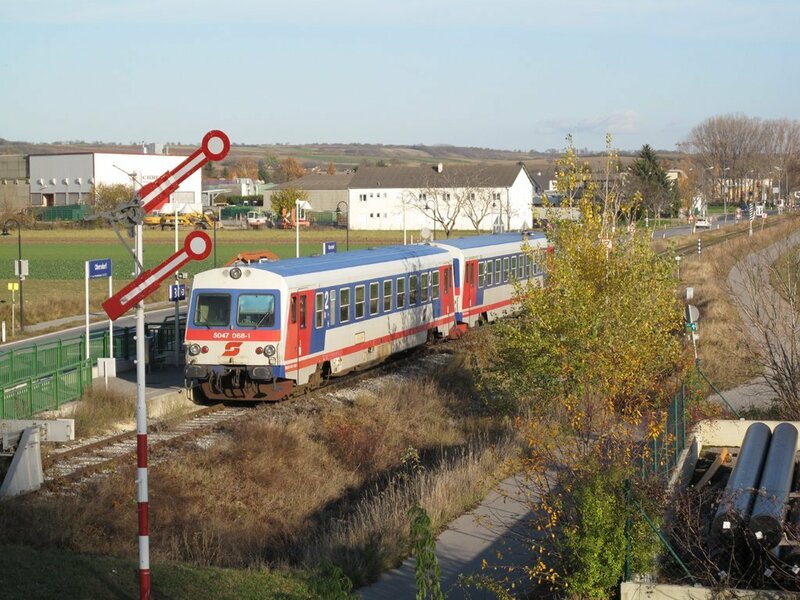 On the way I’d worked out that I could do the north bank line from A-H to Stockerau instead of the already done route via Tulln, so I baled out in favour of an 1116 and a dosto set to Stockerau. It obligingly went across the layout to terminate in P1 eliminating any later grief. The connection therefrom was a 4020 working an S9 to Praterstern. Preserved 93 1403 was noted parked among some wagons at Korneuberg. But more importantly, breakfast was obtained from the Anker shop at Floridsdorf! Having had this I was so pleased that I composed a text to H to tell her about it, thus losing concentration and almost letting the S1 to Gänserndorf go! Very slow going to Gänserndorf, arriving about 7 late. Slow round Sussenbrunn (surely not still suffering the effects of the fire?) and from Deutsch Wagram (bustituted for the next two weekends so presumably moleworks). Still 35 minutes or so at Gänserndorf so I wandered up to the Turkish pub (see 7.8.08) which was of course closed. Seeing the main road nearby, an inspiration suggested there might be a garage, and it might sell beer. There was, and it did. Stiegl for €1.88, amongst other things. It even had a bar, but I thought that a bridge too far! 5047 049 duly arrived from Gross Schweinbarth and worked the 12:47 back. The connection from Wien arrived almost 10 late (in fact with 15 seconds to spare) so had I waited for that one I’d have been more than worried. A slightly surprising ride to GS – a lightly engineered line, which wasn’t surprising, but it runs past a large number of ‘nodding donkeys’. Seeing the first one or two I’d assumed they were for irrigation but when you get up close you can see the logo of OMV [Austria’s national oil company], suppliers of petrol and (to me a few minutes ago) beer. I don’t think the scale is sufficient to make Austria self-sufficient, somehow. [In fact I was right – it supplies only a small fraction of the country’s needs]. 4 minute connection at Gross Schweinbarth which turned up 2 minutes early so only just time for a phot. 5047 033 was the leading one of the pair. Quite why 049, the Gänserndorf one, buffered up to 2070 049 I don’t know (nor do I know why the 2070 was there, in the middle of nowhere). Very nice ride up to Sulz Museumsdorf (was Sulz-Nexing according to the old station nameboard). It’s a 100% agricultural area though and despite its convenience (runs alongside the main street in one village) it’s easy to see it as a target for the bean counters. As is the inevitable way of these things there’s a nice looking pub across the road from the station but with 15 minutes including wandering about and photting time – no. Once past Gross Schweinbarth [on the way back] there are a lot more nodding donkeys along the line to Obersdorf – along with vines, fruit trees, assorted crops and wind turbines. They certainly keep their options open. Also noted at Pillichsdorf was a brand new penny farthing [bicycle] – that’s certainly not anything I’ve seen before. And now I know what ‘Obersdorf hst.’ is about. If Sulz Museumsdorf does indeed close, the dead end line from Gänserndorf to Obersdorf, reversing at Gross Schweinbarth, would seem very vulnerable. [Again checking just before the alleged closure date, it seems that this line completes a quartet of non-closures, making my trip futile from that point of view!] That said there seemed to be quite a few who like me, left the branch train to join the 6020 for Wien from the high level station on the line from Laa an der Thaya, so maybe there’s enough through traffic. It’s certainly not a line for scenic attractions – flat as a pancake from GS to Obersdorf. Doing the change of plan at Absdorf-Hippersdorf and doing the Sulz lines east to west instead of west to east has (if the 6020 manages to stagger to Wien Südbf) gained me half an hour and a chunk of track, so very worthwhile despite my general aversion to changing the plan on the fly. And so to Wien Südbf, collect some food and a couple of beers and settle down for 4 hours of dead track in the dark on IC537, catchily named Alpen-Universität Klagenfurt even though it goes to Villach. A dreadful long slog even with the assistance of Messrs Gösser, Ottakringer and iPod. Once past Wiener Neustadt it was dark; the train was full but not wedged and I had an ‘aircraft’ seat to myself throughout (no, I didn’t leave my bag on the other seat). I could have done without all the coughs and sneezes from in front of me but I’m still here! The only thing that made it dreadful was the suffocating heat. It amazes me that the Austrian nation hasn’t become extinct in such unpleasant and unhealthy conditions! To my relief the train arrived on time at Klagenfurt, where there was plenty of fresh air to be had on the 20 minute (plus another 5 getting slightly lost) walk to the hotel. Food was dispensed with, it looking too much like hard work at 21:00 on a Sunday. No English to be had this morning (and an undercharge on the bill which had them after me for another €5). Generally a nice hotel though (Liebetegger) and I’d stay there again. Pleasant morning for the stroll down to the station, noting the Christmas decorations which are far more restrained and seemly than ours. Called at Spar for water supplies; for future reference there’s a Billa next to the station as well. Provided it’s a day when Austria’s open of course. Also noted was ‘Kleinbahn’, a model railway shop on the west (left going into town) side of Bahnhofstrasse, 5 minutes or so from the station. And of course, the (still) shut homebrew pub 100m from the station! [It shut 20 minutes before I arrived the previous night and hadn’t opened again when I left on the Monday]. Interesting quirk when EC114’s stock arrived by DB’s first of class 101 001. I dived in to wait in comfort (and make sure of a decent seat!). This was DB IC stock and all the reservation signs (the electronic ones) said ‘GGF RESERVIERT’. No paper ones to be seen in my coach of choice, and I was baffled. I had the bright idea of asking, so wrote it down and trotted off to find an English speaking ÖBB person. Found one on the platform – he said he hadn’t the faintest idea what it meant. Decided that I’d go for it anyway and in a different coach found paper labels of the traditional kind. So it looks like ‘Ggf. Reserviert’ means ‘I’m not working, read the paper ones’. An excellent ride to Bischofshofen – lakes, mountains, long tunnels, steep gradients, the whole works. It’s fairly (no, very) leisurely, but when you look at the landscape that’s reasonable enough. I was quite surprised to see a car carrier service through the Tauern tunnel given that there’s a parallel motorway. Punctuality was good, never worse than 3 late and we ran into Schwarzach-St Veit just astern of IC515 which was running in off the Salzburg line. I decided to stick with EC114 in case Schweers & Wall’s interpretation (physical junction east of the station) was correct though I never did work it out. Easy connection into 515 which ran into P3 at Bischofshofen just after I got there from P5. It was formed from DB ex-IR stock which though still comfortable is looking decidedly tatty inside despite the external repaint. We were delayed 8 minutes waiting the München-Klagenfurt EC which was 20 minutes late. Hopefully no consequences of lost paths, but we’ll see. 1044 049 is the haulage. None. A nice gentle plod through the mountains, arriving about 6 late for my 40 minute connection. Into the buff for a beer (open until 14:00 this time – see 30.08.09) only to find it only sells no-alcohol ‘beer’. Off to the village – two of the three pubs shut and no time left for the other one which was more of an amusement arcade anyway. The tobacconist was on his 12:00-14:45 lunch – nice work if you can get it. So I returned empty handed to 4024 065 on the 13:21 REX to Linz for the final track of the trip. Not the most inspiring run on a very grey afternoon though it’s still quite spectacular in the upper reaches. Further down towards the Danube it’s flood plain land, pretty dull. 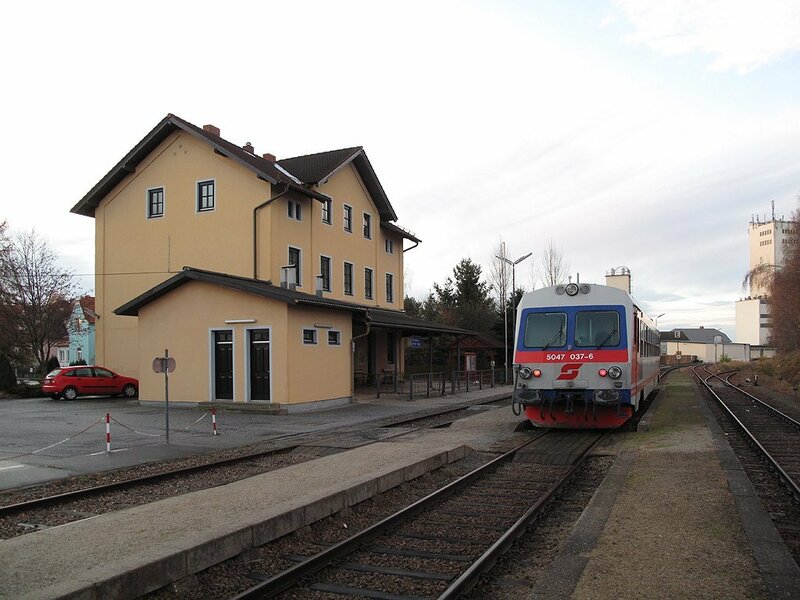 The new alignment between Kirchdorf and Wartberg is now in use; as there’s a new Nußbach station I assume the old one’s gone – add one to the ‘too late’ list. Can’t help wondering if the moleworks which foiled us in August were the commissioning of the new line. So to Linz, looking pretty dismal on a grey Monday but at least it has places to eat! A very nice schnitzel was supplied by the Café de Paris – I doubt I could have eaten it all even with more time... Made the 15:57 to Hörsching OK, so there’s just the challenge of the free bus. 1116 031 was the haulage, not that I note these things. No problem with the minibus – as I’d hoped, an English speaker on the phone and the bus arrived in 5 minutes or so. Others please copy! No further railway interest for this trip – back to the UK on Ryanair (with the beastly fanfare at Stansted) then a long trundle home in the car, beset by temporary overnight roadworks on A14 and M6 which caused me quite a bit of delay. In one sense this trip was a complete waste of time in that none of the threatened closure seem to have materialised. On the other hand three of the four are done now, and the great majority of the daylight hours were spent on new track so it was pretty productive. 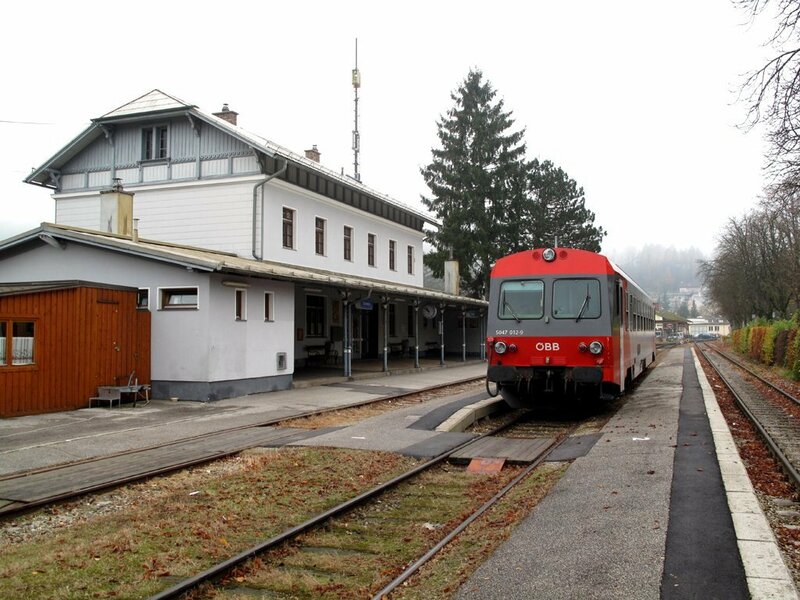 It also filled in the long stretches Spittal-Millstättersee to Schwarzach-St Veit and Bischofshofen-Selzthal-Traun which as far as the ÖBB system’s concerned, leaves me only fairly restricted areas in the eastern and southern parts of the country to cover. And as I don’t work Fridays it only cost me one day’s holiday! That really was it for 2009. Another major plandampf was planned in Germany for April 2010 and we set our sights on that.